You can find the first of my suggestions after the gallery. As with all things Coffee Spot, this guide’s not definitive, nor is it a “best-of” list. Instead, my suggestions are all things which I’ve come across over the past year or two and thought “that would make a good present”. With one or two exceptions, they’re things which I own, having either bought them or been given them during the year, so don’t worry, it’s not a proxy list of things you should be getting me this Christmas! Let’s start with the obvious: coffee. What follows is some general advice on buying coffee, so if you are already well versed in the art, feel free to skip the rest of this paragraph. However, if you are thinking of give coffee as a gift, then there’s one key rule: if in doubt, buy whole beans, not ground coffee. Once ground, coffee starts to lose its freshness, no matter how well packed (although pods seem to be the exception to this rule). On top of that, there is no method known to mankind that can turn ground coffee back into beans. Whole beans, on the other hand, can always be ground; worst-case scenario, most speciality coffee shops will happily grind beans for you if you ask them nicely enough. Of course, if your friend really wants ground coffee, perhaps you should consider the gift of a grinder instead. However, sticking to coffee, there are plenty of options these days. Most roasters offer on-line ordering services for their coffee beans, while something else to consider is a coffee subscription. The options vary from those where the roaster sends out a selection of coffee to subscriptions which allow the recipient to choose the coffee each month. Normally I avoid giving specific recommendations because I don’t use these services myself. However, one name that keeps cropping up on social media and which constantly wins the approval of my coffee-loving friends is Dog & Hat. Dog & Hat select coffee from some of the best roasters across the UK/Europe, which are offered via a variety of subscription services. There’s also a general store where you can buy gift boxes, gift subscriptions and more general goodies, including some gorgeous hand-thrown cups. It would be remiss of me not to mention that Dog & Hat also stock my book, The Philosophy of Coffee. The other subscription service that I would suggest you look at is from Sarah’s Caring Coffee. Sarah is from Holywell in North Wales, the town where I was born and grew up. More to the point, Sarah’s coffee business supports her charity, The Cariad Project, which supports people with disabilities living in Africa. Sarah is also building direct links with coffee farmers in Africa. You can read more about Sarah and her bricks-and-mortar store, The Coffee Bean. Although not really my kind of thing, coffee capsules are a reality and a great way to introducing your friends to speciality coffee. I confess that I was sceptical about until I attended a talk by Maxwell Colonna-Dashwood, which completely changed my mind. Speciality coffee pods are the ideal gift for your coffee-drinking friend who owns a capsule machine and would like to get into speciality coffee, but doesn’t want to/hasn’t got the time to start grinding beans, making Aeropresses, etc. It’s a really easy way to introduce someone to the joys of speciality coffee without any of the hassle. As well as Colonna Coffee, the other main supplier that I know of is Volcano Coffee Works, with a range of fully-compostable coffee capsules. Next up, after the gallery, are some suggestions for cups and coffee kit. One of my personal hobby horses is disposable cups, something I’ve written about over many years on the Coffee Spot. I now own a remarkable number of reusable cups, made from a variety of materials, including plastic, glass, ceramics, bamboo and recycled coffee grounds! Any and all of these would be a great gift for your coffee-drinking friend who keeps instagramming pictures of their coffee is a disposable cup. To help you out, I’ve written a handy guide to all the reusable cups I own. I also wrote about three of this year’s new entrants to the market, made from materials as diverse as rice husk, bamboo and coffee husk. Another option is to help improve someone’s coffee-drinking experience with some coffee-related kit. Many roasters offer gift kits of coffee and brewing equipment, ranging from a humble pour-over kit to some quite sophisticated gift pacts. However, I’ve not really had any new coffee kit this year (probably because of all the travelling I’ve been doing) so rather than repeat myself, take a look at what I said on the subject last year, all of which still stands! You can check out my final gift category, books and other publications, after the gallery. My final category is coffee-related publications. These include books, magazines and (you probably saw this coming) calendars. It would also be remiss of me not to mention that I have written a book of my own, The Philosophy of Coffee, a short but entertaining history of coffee from its origins in Ethiopia to the present day. In a fit of excellent timing, it was published in January this year, so this year is the ideal time to give one as a present. For more details about the book, including how to get your hands on a copy, check out this article! Staying with books, I heartily recommend the Independent Coffee Guide series from Salt Media. This started off with the South West and South Wales Guide, which has since been joined by the North and North Wales, Scottish and Irish Guides. Listing both coffee shops and roasters, along with a smattering of interesting articles, the guides are organised geographically, by city or region. Salt Media is dedicated to keeping these guides up-to-date, with the South West and South Wales guide up to its fifth edition already, while the others are not far behind! Several interesting books have come my way this year, starting with The Coffee Visionary by Jasper Houtman, which tells of the life and legacy of a Dutchman, Alfred Peet. I wrote about this fascinating book earlier this year and can heartily recommend it. Another book which I found myself enthralled with is The Monk of Mokha, the true story of how Mokhtar Alkhanshali, a young Yemeni American, raised in San Francisco, travelled to Yemen to help revive its speciality coffee industry. Another quirky book about coffee that I’ve only just finished reading is Thanks a Thousand by A.J.Jacobs. This slim volume tells the story of how the author was inspired to try to thank every person who has made his morning cup of coffee possible, a journey that finishes in a coffee farm in Colombia. As much a book about gratitude and not taking things for granted as it is about coffee, I found it a thoroughly entertaining read. Finally, if you’ve enjoyed my book, The Philosophy of Coffee, then Jonathon Morris has his book Coffee, A Global History, coming out next week (sensibly just in time for Christmas!). This takes a more in-depth look at the subject than I was able to and should be available to pre-order from the publisher (failing that, you can pre-order it on Amazon). If books aren’t your thing, how about a nice calendar? I still have copies of this year’s Coffee Spot Calendar or there’s always the Café Art Calendar, which supports the homeless. Each year, hundreds of disposable cameras are distributed to homeless people in London and the best photos are chosen for the calendar. In the spirit of disclosure, I was given everything that I have written about in this guide. I should also point out that I wrote the copy for Volcano’s website, while the Coffee Spot Calendar is my own production, the proceeds of which go directly to me. 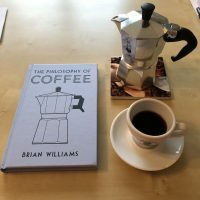 The Philosophy of Coffee is published by the British Library and I get a (very small) percentage of the proceeds of every copy sold.